Walter Hamada, known for producing horror movies, is the new president of DC Entertainment-based movies at Warner Bros.
Warner Bros. has tapped a new man to lead its slate of comic book movies. And it's one of the executive producers behind "The Conjuring" franchise. Warner Bros. announced Thursday that Walter Hamada will be taking over as president of its DC-based film production. Jon Berg and Geoff Johns previously co-ran that division. In December, Warner Bros. announced Johns was segueing out of the role. Hamada is still expected to work closely with Johns, who will reportedly still have creative input. This move comes after a tumultuous 2017 for the studio. 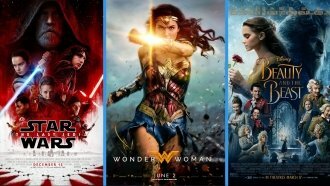 Warner Bros.' saw massive success with "Wonder Woman," but "Justice League" stumbled at the box office. It grossed just over $650 million worldwide. Meanwhile, Hamada has seen commercial success steering horror properties under Warner Bros.' New Line Cinema banner. The four movies in "The Conjuring" franchise have made more than $1.2 billion worldwide combined at the box office. Hamada also executive produced last year's "It," which earned the title of highest-grossing rated-R horror movie ever. Aquaman's solo flick is the only DC movie slated to hit theaters this year.